constance , originally uploaded by gilfling. Nature is an endless inspiration to Constance. She spends her days meticulously painting and embroidering exquisite leaves and flowers onto the vast fabric panels that cover the walls of her home. The old building, which was once a windmill has such a high ceiling that she can almost imagine herself as a tiny sprite wandering amongst the forests of gold embroidered wild flowers which reach up and up and up. Part of a grouping which is to be going to a gallery (and one or two commissions) - more on that soon! I sometimes wonder why my little characters are always so melancholy. It is true I think, that much of my work has that aura to it and indeed I think I am perhaps a melancholy soul at heart. I have often been asked why my characters cannot be more 'happy' although there are also many people who appreciate the 'old soul' quality and respond to this and are moved by this. I think one of the things that I realised this morning when reading many of the stories that I have written for each character is that each and every one of them is alone. They live a solitary existence. As someone who loves company but also finds it absolutely necessary to have 'alone' time too I can appreciate that. I am never ever bored and can spend hours and hours just pottering and doing my own thing. I would love to know what your heartfelt response is to these characters. It is ok to say you don't like them too!! Many people don't and I very much appreciate that! I get mixed reactions to them and like that people either love them or find them too sad. Well I'll be brave and jump in first! I really relate to what you say about needing to be alone and I am just the same. Perhaps because I am similar to you in personality, I often shy away from sad things - tv programmes, books, people even - there is a sort of fear that I will become overwhelmed. For this reason on an emotional level I find it hard to connect with your little people, although artistically I am full of appreciation for them. I like the fact that you make stories and whole worlds for them very much. But for me, I guess I wouldn't want to own one because it might feel a bit like a bad luck charm - a happy doll would tempt me very much though! Hope this is of some interest to you. Oh I love them. I think they help one relate to those times when we are retrospective. I also love alone time. I can function just fine in crowds of people...but I'm quite happy to amuse myself. Probably comes from being an only child. 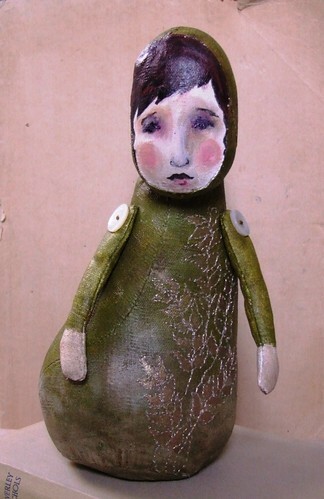 I really love your characterdolls and i like them just as they are. They dont have to smile. Seems like they tell me story's. Please keep them as you do, they're so beautiful. yey, that has cheered me up a bit, the comment on my blog, at least I sold something yesterday!! How about you?? There is something 'other world-ly' about them, they have a depth although they do seem meloncholy. All your work seems to have those qualities and yes, I do like. i adore your character dolls exactly the way they are! they are unique and i find their stories enchanting. i guess i'm melancholic or misanthropic because i would love to spend my days tending to injured hedgehogs and collecting flowers on the grounds of my centuries old estate.